Jordan's parliament offers a prayer in honor of “the spirit” of the two terrorists who murdered five people in Jerusalem. Jordan's parliament on Wednesday offered a prayer and minute's silence in honor of “the spirit” of Ghassan Abu Jamal and Uday Abu Jamal, the two terrorists who murdered five people in a synagogue in Jerusalem on Tuesday. 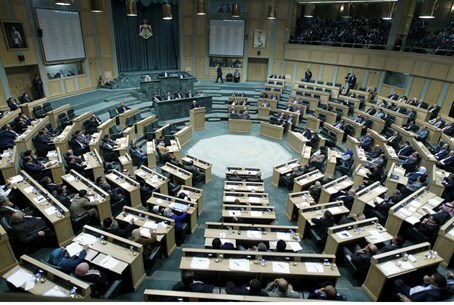 According to the Elder of Ziyon blog, which cited Jordanian Arabic-language media, the prayer was held as the House of Representatives session opened. MP Khalil Attieh requested his fellow representatives to recite the Fatiha, the first chapter of the Koran, for the "spirit of the heroes." Attieh further declared that the murders in the Jerusalem synagogue were a "natural reaction to the occupation crimes against the Al-Aqsa Mosque and the Palestinians," according to Elder of Ziyon. Another MP, Mohammed Al-Qatathh of the House of Representatives, issued a statement to the assembly condemning the "Zionist attack on Jerusalem and its people" in the wake of "the heroic operation" on the synagogue in Har Nof. The blog further noted that earlier on Wednesday, Jordan’s minister of media affairs issued a vague statement on the attack, saying that the government of Jordan "condemns the targeting of civilians, and denounce all acts of violence and terrorism against civilians, no matter who or why it is done." The condemnation was not nearly as specific as the honor for the terrorists given in parliament. Jordan signed a peace treaty with Israel in 1994, but its parliament, which consists mainly of Islamists, has always been anti-Israel and has more than once called to annul the peace treaty. A few months ago, incensed by the shooting death of judge Raed Zeiter at a border crossing with Israel, MPs had demanded the government expel the Israeli ambassador and release Jordanian soldier Ahmad Daqamseh, who shot dead seven Israeli schoolgirls in the 1990s. Jordan recently withdrew its ambassador from Israel, after violent Arab riots on the Temple Mount which it blamed on the Jewish state. There have also been calls to cancel the treaty with Israel in response to the tension on the Temple Mount. In both instances, however, Jordan’s Prime Minister, Abdullah Nsur, ruled out the possibility that his country would cancel the peace deal with Israel.